Given that she is discussing the gangster picture, in its various Oriental and Occidental manifestations on the big and small screens, her claims cannot be accused of excessive modesty in scope. Her role as Associate Editor of Cineaste magazine – a publication both sweeping and idiosyncratic in scope (perennial favourite Abbas Kiarostami sitting alongside Cate Blanchett) – would certainly suggest a pedigree welcoming contradiction and a diversity of means in the investigation of generic trends. Dying to Belong’s format reflects aspects of Cineaste. There is the same, differentiated congruity between generic traditions of extreme cultural, geographic divergence. Likewise, there is the formal faith that edited transcripts of interchanges between author and prime exponents of the publication’s thesis can render statements of conceptual clarity; statements which not only supplement pure theory, but stand in their own right as primary articulation of a thesis derived from the creative process. Yet what is actually being discussed? Nochimson articulates a cross-cultural notion that aspects of the Eastern (specifically Hong Kong) and Western (specifically American) traditions of the gangster picture, while both simultaneously originating from immigrant anxiety and hubris, have historically represented oppositional perspectives on this experience. She credits the Taoist influences from mainland China in creating a gangster protagonist – best exemplified by Chow Yun Fat’s various performances – who definitively rejects the wanton consumerism he observes around him in modern Hong Kong. This protagonist does not wish to achieve acceptance from his environment. In contrast, the American gangster craves respectability. Tony Montana (Al Pacino in Scarface [Brian De Palma, 1983]) desires everything that the United States can offer, blonde trophy wife and all. And yet he is famously unable to transcend his beginnings, never more than a lucrative freak show. Nochimson finally credits a cultural reversal in trends. Orientalism, a faith in transcendence, and a new spirituality now permeate crime histories such as Gangs of New York (Martin Scorsese, 2002) and The Sopranos. Conversely, Infernal Affairs (Andrew Lau, 2002) reflects a growing level of disillusionment with Taoist sentiment in the new, post-colonial Hong Kong. In Nochimson’s appendix, an interview with The Sopranos’ creator David Chase attempts to obliquely engage with the potential of these notions. Nochimson deserves credit for recognising the new polyglot nature of gangster discourse. The Chinese urban establishment as silent partner within Gangs of New York is indeed essential to the establishment of the anti-Nativist New York of the film’s conclusion, and in effect reinforces future power structures in the underworld. The cultural discourses of Russia, Italy, France, and American aboriginals regularly manifest as plot points and narratives of thematic resonance to the central Italian American story of The Sopranos. Specifically, it is a resonance of one dying or antiquated culture providing a future-forward portal to the flayed American Cosa Nostra. The re-assimilated American Indians of the episode “Christopher” (Season 4, Episode 3, 2002) are a prescient reminder of future manifestations the castrated mafia may have to endure. Similarly, in “Everybody Hurts” (Season 4, Episode 6, 2002), a French conman (Jean-Hugues Anglade) attempts to sell snake oil to the provincial Artie Bucco (John Ventimiglia); namely, the notion that continental France still exists in a state of Minelliesque mystique and urbanity, immune to the homogenising effects of the Euro. Indeed, Chase’s gift for delicate referentiality – a key formal component of the series – echoes the work of European masters such as Pedro Almodóvar. The series is built, as Chase himself notes, on an entirely psychological study of a gangster/prince, a pattern located in the continental Sergio Leone’s uniquely European study of American gangsterdom C’era una volta in America (Once Upon a Time in America, 1983), or perhaps even that of fellow Italian Bernardo Bertolucci’s Il Conformista (The Conformist, 1970). In short, The Sopranos is composed, paradoxically, of thematic resonance and formal echoes of both bygone nostalgic traditions – as located in Leone and Bertolucci – and contemporary experiments in narrative dislocation – as found in Almodóvar – which strongly enhance continental discourses on the nature of film and memory. While this may not strictly apply to Nochimson’s thesis, she is justified in creating a theoretical confluence which allows for its existence. Another success of Nochimson’s work is her recognition of the visual motif of darkness in classic Hollywood gangster films. Cinematographer Gordon Willis’ famed top-lighting in The Godfather (Francis Ford Coppola, 1972) does indeed dovetail with the prototypical James Cagney antihero, surrounded yet not overcome by empty darkness on the screen. In The Sopranos, Tony Soprano’s (James Gandolfini) therapy sessions with Dr Melfi (Lorraine Bracco) are so dimly lit as to make her office appear cavernous, the famed lighting scheme of Willis so closely mimicked by series cinematographers Phil Abraham and Alik Sakharov as to appear almost pastiche. Through the use of slow zooms, top-lighting, harsh key lights, short lenses, low angles, and saturated blacks, Tony is surrounded by an encroaching darkness. Indeed, the series’ final image of 11 seconds of blackness may be the definitive statement on the death of all light in the gangster picture. While Cagney’s vivacity shone through the dark, and Willis’ photography controversially flirted with underexposure to the point of parody, Chase boldly presents the final erasure of all style. To reinforce her intercultural analogies, Nochimson devotes separate chapters to what she regards as the former eras of the gangster: the first, golden-era Hollywood; the second, Cold War-era Hollywood. She then dedicates a chapter to classic Taoist Hong Kong gangsterdom, followed by another on the increasingly attenuated street criminal of the later Young and Dangerous (Andrew Lau, 1996) series. In doing so, Nochimson hopes to build a case for the creeping dawning of generic self-awareness paralleling a rise in the gangster’s mutation from gleeful opportunist to humourless ghoul in the Hollywood tradition, and from paradoxically traditionalist individual to utterly urban creature in the Hong Kong tradition. To reinforce these claims, she selects films both popularly acknowledged and seminal (in her view) from given cinematic eras. However, the density of her referentiality reveals untoward erasure of critical debate. In discussing White Heat (Raoul Walsh, 1949), Nochimson notes Cagney’s own admission that his chief villain lacked humour, thus encasing the story in Cold War paranoia and malaise. His Tommy Powers, of The Public Enemy (William A. Wellman, 1931), was a dynamo, albeit a preening fraud, as Nochimson is keen to remind. Yet, to my view, these claims lack critical distance. The black comedy of the Cagney villain blowing airholes in the boot of his car for the benefit of a suffocating prisoner, effectively killing the man, is both shocking and ironic. Most significantly, in this moment Cagney is aware of both his obscene villainy and arch irony, his characteristic energy and humour breaking from the strictures of generic codes and scripts. In utilising the A Better Tomorrow (John Woo, 1986) series, Nochimson certainly seizes upon an archetypal Hong Kong gangster franchaise, marshalling the combined talents of genre masters John Woo, Chow Yun Fat and Tsui Hark (who both directed and produced films in the series). Yet Nochimson fails to differentiate between Woo’s Catholicism, Fat’s beauty and grace, and Hark’s formalism in her claims of a central Taoist theme. In short, in attempting to reinforce an unexpected analogy, Nochimson dedicates too much focus to her central argument, believing that the simple evocation of celebrated titles will ensure their unconditional inclusion in her formulations. Similarly, Nochimson’s claims surrounding The Sopranos betray a lack of detailed critical engagement with supplementary – and even primary – textual evidence. She suggests that characters in the series maintain only the most cursory relationship to their culture of origin, Italy. While it may certainly be argued that many aspects of Soprano life are systematically overvalued – upper middle-brow culture probably being the most salient example – Italianate culture is not overvalued; it is a vital aspect of the minutiae of daily life. One need only think of Carmela’s (Edie Falco) fiery defense of Tony to her mother during her father’s birthday party in “Marco Polo” (Season 5, Episode 8, 2004). The subject of her mother’s embarrassment – Tony’s provincial Italianate posturing – and Carmela’s spirited defence represent an unlikely conjuncture at such a point in the fifth season’s narrative. Carmela and Tony are well into their separation, and his presence at her father’s celebration is heavily negotiated. As such, she has no obligation whatsoever to defend him. What becomes clear is that not only is her former pride in her husband hurt, but so too is her immediate pride in her children, when she observes that her mother noted Meadow’s (Jamie-Lynn Sigler) dark Sicilian complexion as a baby. This Italianate pride undoes Nochimson’s claim that the transcendent primarily represents the Soprano family’s essential values. In closing, one should return to the initial claim of the gangster picture’s morality. Nochimson’s claim makes sense in that she certainly engages with morality in stages of transformation. The cultural exchange requires morality as its essential invisible unit. Yet in taking a scattershot approach to the evocation of said morality, through both referentiality and a general cultural matrix, the relativism engendered undoes the permanence of such claims. Nochimson’s Cineaste-honed passion for scope works against her. 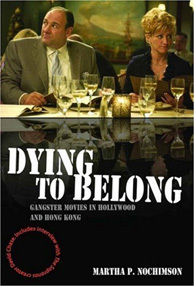 Dying to Belong: Gangster Movies in Hollywood and Hong Kong, by Martha P. Nochimson, Blackwell Publishing, Malden, MA, 2007.